I've mentioned it in my posts before, and I'll say it again - I LOVE POTATOES. My favorite kind of potatoes are mashed, and if you know me, you probably already know that. It's kind of weird how much I love mashed potatoes. Regardless, since I love them so much, I make them a LOT. I have never really been able to get them the exact way I like them, however. Seems simple enough, peel, quarter, and boil, then add butter, salt, pepper, and a bit of milk, and mash. Easy, right? Seems not. Boil the potatoes in a salted pot of water until tender when pierced with a fork (about 20 minutes). Drain, return to the pot, add the butter, and let sit for a bit, at least 5 minutes - you can prep other portions of your meal at this time. When you are ready to finish the potatoes, add a healthy pinch of sea salt and pepper. Use a manual masher to start mashing. Then, get out your electric hand mixer and mix at the lowest setting, slowly adding the half and half until it's blended and the potatoes are fluffy and thick. Add more salt and pepper to taste. Makes 4 cups or so. These are unbelieveable - perfect texture and flavor. I finally cracked the code! Today it snowed literally the entire day! And it's STILL snowing! It's the kind of day where you just want to snuggle up on the couch with a warm blanket and a good LifeTime movie (um...). View from my office today -- brrr! I wanted to make something warm and comforting for dinner and I had a bunch of stuff from last week's farm delivery that I wasn't sure how to use up - mainly, kale! I have never had kale before but I've read about the health benefits and I know it's pretty versatile. I found a recipe on Epicurious for Kale, Cannellini Bean and Potato Soup and decided to go for it! Pour in the chicken broth, water, and white wine; stir in the potatoes, green beans, rosemary, sage, and thyme. Bring to a boil over high heat, then reduce heat to medium-low, cover, and simmer until the potatoes are tender, about 20 minutes. Add the cannelini beans, kale, red pepper flakes, and black pepper, and simmer, covered, for 30 more minutes. Taste and add as much sea salt as you want. YUM! Seriously, this was sooo good! Keith doesn't even like soup (or things without meat in them) and he went for seconds. I also had two bowls and I'm absolutely stuffed. Also, there's a ton left - at least two more servings. I added the green beans since I had a bunch from last week's farm delivery and I wanted to use them up, and I'm so glad I did - they added another dimension to the soup, which might have been considered a little mushy without them. I think adding celery or mushrooms would also taste fantastic. It was also really easy and it didn't take a lot of thinking (chopping, yes; thinking, no). Love this and definitely will be making it again! We have a special Wednesday farm delivery and I signed up so I can have farm-fresh fruits and veggies in my Thanksgiving Day feast! This is my first time making Thanksgiving dinner so it should be interesting, but at least I will have the help of my very culinary-inclined mom! I will definitely make sure to take tons of pictures! I rearranged a lot of things on the delivery this week so that I don't have to buy as much stuff from the grocery store; but, my shopping list was still approximately 3 feet long! Full Circle Farm, Carnation, Washington. Farmer's Own Organics, Seattle, Washington. I kept this in here even though I have no use for it in our Thanksgiving meal because I've never had a Satsuma, or even seen one! Like the orange, the Satsuma is a good source of fiber, and also boosts the autoimmune system with a healthy dose of vitamin C, helping to protect against heart disease and lower cholesterol. Known as the "Honey Citrus of Whenzou" the satsuma came to the United States through Japan, but is a citrus variety cultivated originally in China. Earth Conscious Organics, Brewster, Washington. While we were watching The Walking Dead on AMC (great show by the way), I decided I wanted a snack. We keep getting a ton of fruit in our farm delivery and I try valiantly not to let it go to waste, but sometimes it's hard to eat it all! I decided to make something a little healthy after our fairly heavy dinner. Pre-heat the oven to 350 degrees. Chop the apples into bite-sized pieces and put them into a medium-sized bowl. Add the cinnamon, brown sugar and sugar, and stir. Then, drizzle the butter over the apples and stir, making sure that all ingredients are evenly distributed. Spread the apple mixture evenly into a small glass baking dish. Bake for 30 - 35 minutes, until the apples are tender. Keith liked this so much he literally licked the bowl clean. I balked at first but then took it as a compliment! Things have been pretty busy around here lately! My parents are coming into town on Tuesday so we spent of lot of this weekend cleaning, getting things together, and shopping for the Thanksgiving feast, of course! I also had a particularly busy week at work, having to stay until 7:30 / 8pm almost every day last week. Thank goodness for a short work week! We have a ton of groceries in the house but most of them are hands off until Wednesday / Thursday. I didn't feel like going out (again) so I fell back on my trusty stand-by: pasta! I made my own version of the classic Fettucine Alfredo dish. I use a lot more cheese and less butter than most recipes call for, but once again, I just LOVE cheese! This comes out tasty and flavorful. I recommend having your dining companions add more salt, pepper, and cheese to their tastes once the food is in their bowls - it's much easier to please everyone that way! Cook the pasta in a pot of boiling salted water until just al dente. Reserve 1/2 cup cooking water, then drain pasta. Meanwhile, simmer the cream and butter in a skillet over medium low heat. Add the salt and pepper, stir to mix for a minute or so. Then add the shrimp and simmer for another 2 minutes. Finally, add the pasta and cheese. Depending on how thick or thin you like your sauce, add desired amount of cooking water to thin. Toss and serve! Store Credit Cards: Most money management websites and articles will give you the advice to NEVER sign up for store credit cards. Their points are valid: the cards have high interest rates, and they can tempt you to buy things you don't need. However, if you already spend a lot of your money in a particular place, the benefits of being a cardholder can outweigh the negatives. Some stores have amazing cardholder benefits! Take a look at Nordstrom or Macy's - both have points systems that give you gift cards once you spend a certain amount, which equals money back in your pocket. They also give you access to special sales, additional discounts, and more. Even smaller stores, such as Banana Republic and Express have pretty perks - Banana Republic has a Visa card that's good anywhere and earns you reward points on everything from gas to groceries. Express cardholders are entitled to significant discounts, as much as 40% off. Even better, if you know you are going to get a motherload of Christmas presents at a specific store, you can usually get a pretty good discount just for signing up for the store card. Another 20% off on top of sale prices or other discounts can really add up! Make sure you pay off your balance each month and only buy what you need, but it makes perfect sense to get rewarded for the things you would have bought anyway! Travel Credit Cards: These cards are a great idea for the frequent traveler. Earn points on money spent on airfare, hotels and rental cars to get money back in the form of airline miles or even cash. If you belong to a frequent flyer program, such as Delta SkyMiles, find a card that will help you accrue SkyMiles on everyday purchases to help offset the cost of travel. Again, make sure you pay off your balance each month and you'll be sitting pretty with discounted seats, free checked baggage, and even free upgrades. Reward Credit Cards: Everyone should have an "everyday" credit card. You know, the one you use for your usual purchases like groceries, dining out, and gas for your car. Since you use this card every day (and pay it off every month...right? RIGHT?! ), it only makes sense that it should do some work for you. There are tons of cards out there that can get you points for rewards, cash back, and more. Do your research before picking a card and make sure it fits your lifestyle. The bottom line is that credit cards can be a great asset to a shrewd shopper. Make 'em work for you, but don't forget, MAKE SURE YOU PAY YOUR CARD OFF EVERY MONTH! You may or may not have noticed the tabs across the top of my blog. If so, you might have seen the really fabulous "Under Construction" graphic I had up there. Well, thanks to the awesome coding skillz of my good friend JD, the tabs now work! A member of the chicory family, Treviso is a mild variety of radicchio that is shaped like an elongated cabbage with long purple leaves and thick white ribs. 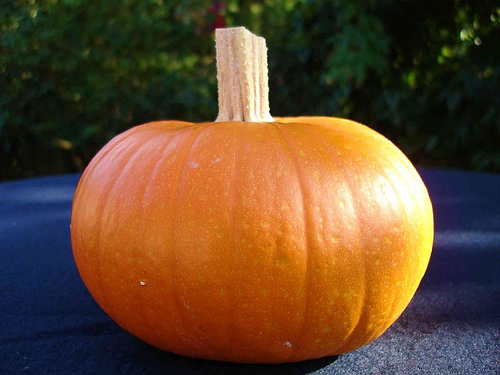 It has a firm texture with slightly bitter leaves. Wonderful when heated but can be eaten raw. A descendant of the wild cabbage, kale is a cruciferous green widely prized for its wide variety of health benefits. Best braised to tenderness to retain nutrient value, kale has a slightly bitter earthy flavor that provides more nutrients per pound without the calories than any other vegetable. Occurring naturally in grasslands, fields and meadows across Europe and North America, Creminis were first cultivated in France, where they are known as "champignons de Paris." Picked young, they are Creminis. Left to grow, they are known as Portobellos, much larger and with a muskier flavor. Lakeside Organic Gardens, Watsonville, California. Good day to you fine people. Below follows a cautionary tale, one with tragedy-like events, and I assure you, it's all true. Brace yourselves, dear readers, and continue reading...if you dare! This was an entry in my LiveJournal from May 10th, 2005. 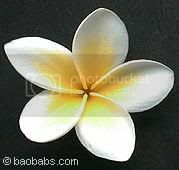 This is a frangipani, my absolute favorite flower. They grow everywhere in Australia and smell sooo good. I have decided they are going to be the main flower in all my wedding bouquets. Hehe, planning ahead never hurt anybody! I leave for Tassie in about 30 hours, so excited! That is all, good nite! SO, how weird is it that the frangipani WAS the main flower in my wedding bouquets; and even weirder still, that I got married on May 9, 2009?!?!?! Oooh TWILIGHT ZONE!!! I have been scouting yummy-sounding recipes and yesterday's dinner was the results of some of that work. I had some fresh halibut to use, and I received brussels sprouts in my farm delivery last week. I had NO idea what to do with them, and the only memories I have of brussels sprouts begin with boiled frozen sprouts circa 1994, tears, and dramatic gagging noises; and end with my sister and me spitting and / or hiding them into napkins when the parentals weren't looking. Ah, the stories I could tell...but I digress. I found a quick but delicious-sounding recipe for red snapper and decided to sub in my halibut filet for it. The recipe recommended a potato dish as a side. If you know me you know that I have a slight issue with potatoes...I LOVE THEM. I had some Yukon Golds from last week's farm delivery, and since I'm always looking for new ways to cook potatoes (seriously, I could live off of potatoes), I gave it a shot. Last but not least, the brussels sprouts. After much searching, I found a recipe called Brussels Sprouts for People Who Think They Hate Brussels Sprouts. I mean, what else is there to say, exactly? It was a good dinner but it wasn't anything I would rave about. And yes, I totally forgot to take pictures...AGAIN. I was reviewing my blog stats today (because I'm that much of a nerd) and I noticed that the entry for Wild Pacific Cod has by far the most page views. I'm thinking it's because of the pictures. This is further proof that people just don't like to read. People like pretty colors: Pictures and video capture people's attention much more than words on a page. Conversely, too many pictures or graphics will just confuse their eye and make it hard for them to focus on the important things. Moral: don't clutter your site with silly animated .gifs or goofy illustrations. Make sure everything you have on your site has a purpose and achieves that purpose. Evolution, baby: So, the site's live - that means the work is done, right? Wrong! You should constantly be changing things around, adding things, deleting things, etc. It's survival of the fittest, and things are constantly changing, especially on the internet. Analyze where your traffic is coming from, review how often things are clicked, and revise your site as needed. This is a never-ending process, and the only way to keep people interested is to evolve. Imitation is the sincerest form of flattery: I'm not saying to copy that website you think is great, but definitely do your research. Look at the websites that you think are effective, and take cues from them. Successful websites are a combination of great design, compelling content, and a well thought-out architecture. Make sure these three things are a big part of your focus. Use a designer: This is important. Just because you can use Paint or SnagIt does not make you qualified to design a webpage. And if you think Comic Sans is a great font to express your playful side...God help you. Let the professionals do their jobs. Your website is almost always the first thing that people go to in order to learn about your company, service or product. You want to make a good impression, so don't throw something up there just to gain an online presence. Ask yourself if your website says what you want it to say. RueLaLa: This site is "private" (as in members only) and a bargain hunter's dream. They have 4 - 6 boutiques every day that range from clothes, shoes, fine jewelry, travel, sports memorabilia, restaurants, cookware, home goods, pretty much everything. Some deals I've gotten have included 50% off an upgraded room for a mini-vacation at the W in Fort Lauderdale, a $400 Betsey Johnson dress (which was for sale on Betsey Johnson's website for $350) for $150, and a $100 blanket for $29. To become a member you just need to sign up and provide your email address. Daily Candy: Daily Candy is a great site / email program. They have different editions for most major cities and also some others like deals, baby, and everywhere. They call the daily emails "Candies" and they have everything from neat tidbits about what to do that weekend around your city, great websites to check out, and even contests. I've learned about a LOT of great websites through Daily Candy. RetailMeNot: One thing I learned from my husband is that you should never buy something online without a coupon code :) RetailMeNot is a site that compiles reliable coupon codes to save you anywhere from free shipping to straight up money off your bill. It's practically putting dollars back in your pocket. So next time you are about to hit Buy Now on a site, make sure you check for a coupon code. CreditKarma: This site is a great resource! You can check your credit score for free, as much as you want. Great for those who are trying to improve their credit score, but also a useful tool to see how certain actions affect your score (i.e. closing a credit card, paying off a debt, etc). What sites do you use? Any good ones I missed? The results are in! When you don't have a lot of time to whip up something fabulous, the majority of you turn to.... pasta! I definitely do, too. Pasta is so versatile and fast, and also delicious. I could eat pasta every day of the week and never have the same meal twice. In honor of our beloved pasta winner, here are some of my favorite ways to make it!